Deemed a pre-tournament favorite, Japan won the HSBC Sevens World Series qualifying tournament in Hong Kong, dominating nearly all its opponents en route to beating Italy, 26-5, in the final. The one close call came in the semifinals, when it beat Russia, 19-14, in sudden death. Italy had reached the final by defeating local hopefuls Hong Kong. Japan’s victory was significant for two reasons. This was the first year that Hong Kong hosted such a qualifying event, guaranteeing the champion a spot as a “core” team in the 2014-2015 Series – in other words, a promotion to the main draw. This means that the last-place team this season, which will be determined after the ninth and final event in London from May 10-11, will be relegated. In addition, Japan has the opportunity to set its sights even higher. With rugby sevens set to make its Olympic debut in Rio in 2016, the top four finishers in next season’s World Series automatically earn berths to the Games. 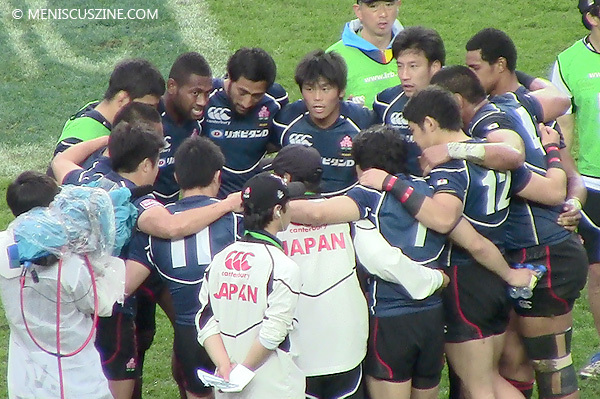 Almost superseding Japan’s excellent play over the weekend was a last-minute drive in the final by Kosuke Hashino. It could have ended as try and an exclamation point to the title – but instead became a botched swan dive.